Demboin-Dori isn't only a shopping street but a entertainment street! Demboin-Dori isn't just a shopping street! Demboin-Dori (shopping street) leads west to Nakamise-Dori has 23 shops in 200 meters have been helping Japanse people and tourist fulfill their gift-giving obligations. One side of it faces the Demboin so it is called Demboin-Dori. It was reproduced street of Edo period (1603-1868 CE) as possible in 2005, and created with good ideas for entertaining tourists. For example, the shutters of shops are decorated with portrait of celebrity in Edo period (1603-1868 CE), of course you can enjoy shopping after shops open. Some of 23 shops is long-established, Yonoya selling Japanese ornamental hairpins is opening from 1717, Kanaya selling brushes is opening from 1914. 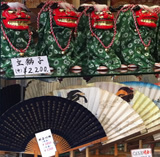 Furthermore, Japanese cut galss decorated by cutting and grinding its faces to and Japnese hand towels and more. The notice board described mug out (it's Nezumi Kozo is a thief and folk hero lived in Edo period) stands in Demboin-Dori. The statue of Nezumi Kozo and great actors in Edo period is hiding here and there. 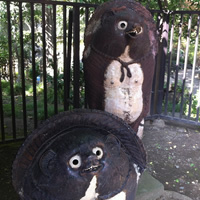 If you'll visit Demboin-Dori in Asakusa, you enjoy looking for them and challenging finding all statues.